Suddenly bacon is everywhere. There are websites entirely devoted to bacon recipes. There are bacon T-Shirts. There's even someone selling a bacon inspired, (and scent infused), tuxedo. Bacon has made a culinary comeback. It's now hip. Bacon is being wrapped around everything from fruit to fish. It's even being dipped in chocolate. Using an adequately repellent name of "Pig Licker" , chefs from the Famous Dave's restaurant chain take thick cut bacon, cook it until crisp, jam a stick into it, dip it into dark chocolate and then sprinkle it with sea salt. This "delicacy" is served cold; perfect for eating while strolling the state fair. By the way, that cheering you hear is your local heart surgeon and his Mercedes dealer urging you to buy two. I'm pretty much a traditionalist when it comes to bacon. Serve it with eggs and I'm happy; occasionally slip it onto a burger, I'm OK with that. But the truth is that the apex of bacon technology rests in a humble sandwich. 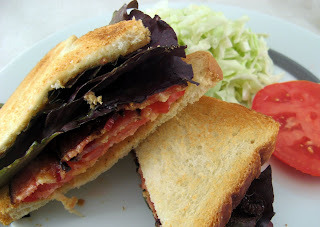 The BLT, Bacon, Lettuce and Tomato with mayo. Simple, straightforward, the best use of processed, spongy, pre-sliced white bread known to man. With the tomatoes ripening, I'd be willing to eat this sandwich for weeks on end (of course, SSSal and my doctor have different ideas, killjoys). 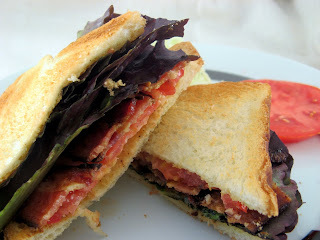 So here's my "recipe" for a BLT with homemade mayonnaise. Don't dip it in chocolate and don't jam it with a stick (well maybe a toothpick if you're into "fancy" presentations). Enjoy. In a glass bowl, whisk together the 2 egg yolks, (no matter what recipe you find that asks for only 1 yolk, ignore it. There is no way you'll be able to emulsify this mayonnaise with only one yolk). Add the mustard and salt and whisk well to incorporate. In a separate bowl combine the vinegar and lemon juice. Add half the lemon juice/vinegar mixture and whisk. Slowly, very slowly, add the oil while constantly whisking. Once half the oil has been added you can increase the flow rate. Whisk vigorously until all the oil is incorporated. Let the mayonnaise sit at room temperature for 30 minutes then refrigerate. Disclaimer: Raw eggs might be bad for you (though I've never gotten sick from them, so if you're really worried about it, use pasteurized eggs). Preheat our oven to 400 degrees. Line a baking pan with heavy duty aluminum foil. Lay the bacon out in strips making sure not to overlap the pieces (you may need to have two baking sheets or work in batches). Roast the bacon for 12 - 18 minutes depending on thickness and desired crispness. Remove from oven, transfer to plate with paper towels to blot away excess fat. Place bread slices in toaster. Depress button, wait. When bread pops, remove and spread, slather or (if you're from the Northeast) schmear the toast with your homemade mayonnaise. Place one large slice of tomato atop the bread. Add an appropriate amount of bacon (depending on weight and cholesterol levels, you may wish to consult with your physician regarding this amount). Add lettuces pieces. Cover with other slice of bread. Cut on a diagonal and serve with coleslaw. Eat and sigh at the wondrous simplicity of your creation. The perfect summer lunch, or if you have a sandwich or three, the perfect summer dinner. Until next time crablings, remember, you can do it, you can cook. Now I know what it is I want for lunch Crabby! That looks so good! So when do we get the coleslaw recipe? I LOVE BACON; seriously. And with tomatoes? My personal heaven. So I had to laugh, b/c one of my last posts was all about being crabby:). I seriously thought I'd love the bacon-chocolate combination but I had the Vosges bacon bar and wasn't impressed. I'd much rather have a BLT with homemade mayo. Your's looks really good!